Click here to view frequently asked questions about our properties, eligibility and more. You may also click here to view all current listings on our Zillow page! 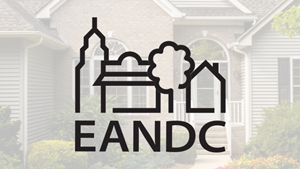 EANDC is an experienced developer of quality single-family homes. We partner with local builders to provide attractive, well-built houses that are assets for residents and neighborhoods. While the size and features of the homes we develop vary, all are designed for comfort and energy efficiency. Contact your local EANDC Property Management office (locations detailed here) for the latest information on availability. NOTE: To apply for this property, you must be a disabled veteran. Applications must be submitted through Akron Metro Housing Authority (AMHA)’s website. More interested in buying a home? Check out our Homebuyer Education Course.